A sling is widely used in order to hold the shoulder and the arm of a patient who has suffered a cerebrovascular accident and therefore has a hemiparesis. I consider it necessary discussing the true usefulness of such a device and point out some aspects that are not usually taken into consideration hence running the risk of triggering a boomerang effect. What is the reason for advising the use of a sling for the shoulder? The prescription of this protector generally happens at the rehabilitation hospital or clinic, most of the time within the first months immediately following the CVA, that is to say, when the patient is facing the first stages of the diaschisis, presenting a paralysis defined as “flaccid” in which the superior limb is collapsed and without a muscular tone. The Doctors and Therapists usually recommend the sling for the shoulder intending to avoid or prevent what is defined as a Glenohumeral Subluxation (GHS), that is to say, the loss of the articular relation between the head of the humerus and its glenoid lodging (the hollow portion of the shoulder blade). Mark or sign in the shoulder. After a cerebral hemorrhage and the paralysis of half of the side of the body, including the arm, a reduction of the muscular tone is produced, thus decreasing the containment of the articulation. There is a peculiar sign or mark that usually sets off alarms a bit beyond reasoning, on sanitary personnel, patients, and relatives, which is a mark or sign on the shoulder, which really amounts to a small hole that appears between the shoulder and the humerus. This alarm along with the frequent discomfort and pain that the patient feels also in the shoulder area, makes the use of a sling to hold the shoulder, a decision widely shared. However, is it really useful? There is no patient that I can remember whom I have not taken the sling off, and among them, we have never experienced any need to use it again. Along the next lines, I will explain my distaste for the use of a sling for the shoulder of a hemiplegic patient. 1) The reduction of the muscular tone after a hemiplegia, is completely physiological, what I mean is that it is compatible with the first stages of the convalescence, when the organism experiences a hyper excitability condition, a sort of necessity of stillness requested by our body. The humerus has been keeping its place not only due to the muscles, but also due to the ligaments, therefore the risks of spontaneous luxation or subluxation are excluded. What could originate a luxation in these cases, are the traumatic type eventualities, like an unforeseen fall which is the most common, or the tendency to help the patient to get up, holding him by the paralyzed arm. This latter one seems obvious, but due to the experience, it always forces me to emphasize that you must always help the patient to get up only by the side opposite to the injury. 2) We have discussed about the pain post CVA in this page; and here we can summarize the argument saying that the pain that the patient usually feels after a cerebrovascular accident is of a neurological type, i.e. a pain caused by the alteration of the information perceived by the body, and not necessarily by a physiological problem of the joints or articulations. To this, you obviously have to add the condition of lack of mobility of the shoulder plus the disagreeable sensation of the weight of the arm. Therefore, any unpleasant feeling can be altered and amplified by the neurological condition. The hemiplegic patient problem is not only reflected in the arm movement, but also by the perception and the difficulty to pay it attention, (about this topic, please read the article about the neglect). To tie up with a sling the arm where the patient has awareness perception difficulties, does not help the therapeutic process which in turn should be precisely aimed to the improvement of these cognitive processes. Therefore, it means to exclude the patient’s arm from the therapeutic process, and the arm should also be extended in all the hours where the patient does not have therapy. 3) When the patient is in the first stages of the recovery, he does not have much ability to autonomously walk thus he spends a lot of time sitting on a chair. In this case, it is useless to wear the sling, because the ideal position is to have the hand resting on a flat and stable pillow or cushion placed on his lap. (you can find the complete explanation of how to handle the hand on a sitting position in (this page). This way, the weight of the arm is held by the pillow or the cushion or by the half- moon of the wheelchair. 4) Generally, the use of the sling is justified by the fact that the patient should use it when he walks, because due to the flaccid phase of the hemiplegia, the weight of the arm rests on his shoulder. But then here we will get into an issue even broader, the amount of walking that we can allow in the first stages of the recovery in order to avoid that the patient creates compensations or vices on his walking. (for a more in depth reading of the hemiplegic gait, I suggest this article). Therefore in the first stages there will not be very many situations where he should walk, or at least not as may that would justify the use of a sling for the shoulder. 5) Furthermore, the gait is not only done with the legs, since the arms are also used, and the patient should learn how to handle them during his gait, without any imposed type of limitations. 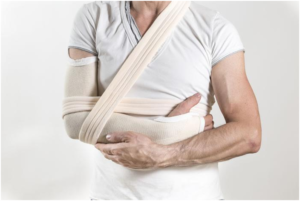 The sling for the shoulder is prescribed as a solution to avoid the risk of a subluxation, but the inadequate assistance or activities in the rehabilitation are the ones that create such a risk, thus it is better to perform with the correct and proper procedures of the daily rehabilitation.